I am approached by a lot of people that have a bike, started riding, and become addicted to the sport. They are at a point where they ride, have fun, but are not really getting any faster and do not know what to do to get the best bang for the buck in cycling performance. Many riders are limited on training time and how many days they are available to ride. This plan lays out quality work for these riders. You are provided short workouts of 1 to 1.5 hours each during the week days. These give the most benefit for improvement in your limited time. Weekends also include short workouts, but with an option to add on endurance miles after the heart of the workout is completed. This is an 8 week plan. 4 to 5 workouts each week averaging 6 to 7 hours per week. The workouts are designed for the beginner rider that needs direction in improving their abilities and skills. The variety of work in the plan will expose the rider to all facets of workloads and demands. Cycling fitness will improve, new power and endurance will develop. After a 1-2 week rest period of very easy recovery and cross training, the plan can be repeated. Prior to this plan I suggest that you do a FTP test (Functional Threshold Power). Two options are available. A 20 minute test or 2 x 8 minute all out efforts. We need a baseline so when the workouts are used you will be riding at the correct level of exertion. Most indoor trainers have some type of power measuring capability and this is also the best place to test due to indoors being a completely controlled environment (no stop signs or red lights to interrupt you). 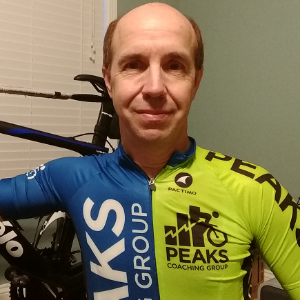 Be sure to set your FTP correctly on the Training Peaks website. If you do not have a power meter we can do a heart rate based test on an indoor trainer using Zwift. After a 12 minute warm up do 3 x 10 minutes at Tempo. On the first effort ride at 75 rpm, the next at 90 rpm, the last one at 100-105 rpm. Rest an easy 5 minutes between each effort. These lower effort intervals while riding at the various cadence shown, will show you how your heart rate reacts and also your perceived level of exertion. Your tempo watts will feel a lot different at 75 rpm than at 100+ rpm. Over time doing a workout like this you will adapt and be able to handle power at various cadence. 10 x 1 minute one leg pedaling intervals switching legs every minute. No rest between, just enough time to clip in and unclip other foot. Form very critical. Picture a box. Push your foot across the top, down the front, across bottom, unweighted leg on back of box. MOST important is across top and start down stroke at 1 o'clock position all the way down to 5 o'clock position. Then 10 minutes at mid Zone 2. Now do 10 x 1 min fast pedaling with cadence at 100+ at 75% FTP. Take 1 mins easy between each. WE WORK ON HIGHER CADENCE UNDER HIGHER WATTS TODAY. Review the workout builder. Some sets you will continue the specified cadence during the lower wattage rest periods too. Example is set two, you ride at 100 rpm for the entire 3 minutes, set 3 is 95 rpm, for 9 minutes. Today's goal is to build up your aerobic capacity, which will be done by riding at at endurance/tempo pace. 1.5 hours of riding with watts in Upper Endurance/Lower Tempo zone Keep cadence in the 90-95 rpm range. Cool down 10 minutes of easy riding, then stretch. 3 x 3 minutes@ VO2Max. Start each one with a hard 10 second jump. Get to speed quickly then hammer for the remainder of the three minutes. Then get in 10 minutes easy cruising. Now do 1 x 5 minutes at FTP + 5%, 5 minutes easy after. Remainder of ride time at zone 2. If your time is limited today then cut back the zone 2. Zone 1 active recovery today. 45 minutes. Nice and easy. No burn, no power. Just spin and loosen the legs. Now do 3 x 7 minutes at Tempo. On the first effort ride at 75 rpm, the next at 90 rpm, the last one at 105 rpm. Rest an easy 5 minutes between each effort. If you want to push through and do a straight 45 minutes at SST that is fine, but be sure to change cadence at each 7 minute mark (75, then 90, then 105 last).